Foam Tubing To provide Easy Grip Handles Etc. The foam creates an easy grip for everything from tools, to your toothbrush, creating greater hold and control for those suffering from a weak or painful grip. 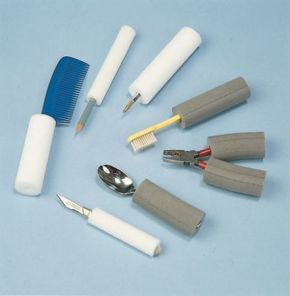 From foam cutlery handles to easy grip hairbrush handles - versatile and convenient. I bought the foam tubing to put on some knives on the advice of my GP to try and reduce the inflammation that is causing my \'clicky\' finger. It is very comfortable to use, but only time will tell whether it is working. The foam tubing is very useful for items with very thin handles eg painting brushes for art. The tubing was suggested to me by my physiotherapist, and I would recommend this product.